Kirsten, originally uploaded by antbike. Mike Flanigan is one of the most innovative bicycle designers in the US. His vision is unique, I think, because he appears to be constantly re-evaluating the principles, goals, and objectives that drive his designs. Obviously, he has a strong dedication to practical use, but his bikes demonstrate a continually deepening understanding of this principle, and a corresponding continual evolution of its implementation. Most striking in this and other recent work is the open-minded combination of old and new technology. In addition, the focus on practicality appears to be extraordinarily broad. It includes many of issues commonly understood to be part of sustainabiliy, such as efficiency in construction and supply chain issues. 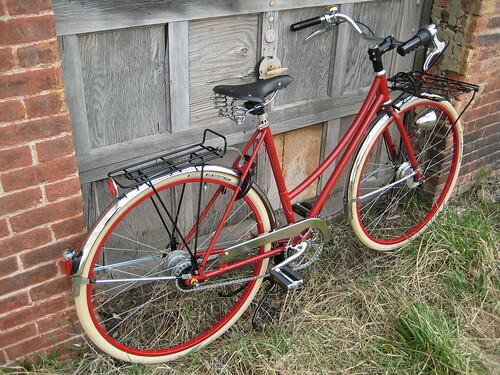 For example, several parts on this bike are made by WALD, Inc., a domestic (US) manufacturer. They are not particularly light or refined, but they are extemely functional and inexpensive, and they support domestic industry. I'm don't think of myself as a protectionist, but most bicycles made these days are made entirely and exclusively overseas. This one is distinctly multi-cultural, with three continents well represented.